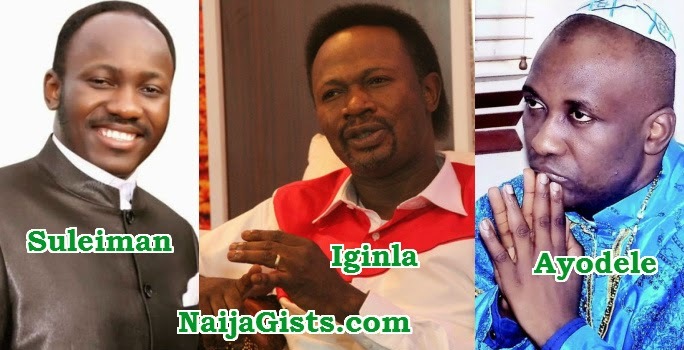 Meet the pastors who predicted President Goodluck Jonathan’s victory in the just concluded election. Most of these self proclaimed prophets boasted to the media that God revealed to them in a vision that APC has no place inside Aso Rock. (1) Prophet Joshua Iginla, the founder of Champions Royal Assembly said God revealed to him that President Goodluck Jonathan would win the elections but his prophesy didn’t come to pass. Primate Ayodele’s prophecy also failed to materialise. The reverse happened, President Jonathan is going back to Otuoke not coming back to Aso Rock. Prophet Sule missed the vision. I wish these men had played it safe. With all these false predictions, how can we really believe God showed it to them. God is not an author of confusion. It is high time people stop going to these fraudsters all over the place claiming to be pastors. Worship the one true God and stop being a fool. All these pastors are wicked men. Imagine *******, Oritsejafor etc that never endorsed Osibanjo…they only endorse dollar bills. Work hard and pray to God direct, abandon all these Millionaire crusaders. We were asked by our man of God prophet TB Joshua to fast since last week and for Tuesdays and to wipe away the cloud that is over Nigeria for peace and most of us did. And God answered our prayers. Though there are some fake prophets Nigeria is blessed with some strong men of God and thank God for that. Thank God for peace. God Is Not Yet Through With This Election. Lets Watch What God Will Do With Nigeria’s Destiny. Whoever You Are, If You Speak Against Any Of This Men Of God, Then Get Ready, God Will Answer You On Their Behalf, So, Becareful. Whatever God Choose To Do, Let Him Do. GOD HAS NOT CHANGE, HE KNOWS WHAT HE IS DOING. People That Are Talking, Even In Your Truth, Keep Quiet Or You Fall In God’s Hand. We are all men of God or men of the Devil. What these Black jokers are doing is similar to what the White men did–tricked the poor and destitute…. These blooming scoundrels have turned religion among the poor into a profitable business activities. Why has God not used these so-called prophets to rid the nation of poverty, crime and other miseries? People, when will you wake up from your slumber? you must be sick, they are all fake prophet who don’t know God have left them. God doesn’t ever makes mistakes and if these ones didn’t get it right they are far, very far from God. So don’t come here to talk nonsense. The word of the Lord came to Jonah a second time, saying, 2 “Get up, go to Nineveh, that great city, and proclaim to it the message that I tell you.” 3 So Jonah set out and went to Nineveh, according to the word of the Lord. Now Nineveh was an exceedingly large city, a three days’ walk across. 4 Jonah began to go into the city, going a day’s walk. And he cried out, “Forty days more, and Nineveh shall be overthrown!” 5 And the people of Nineveh believed God; they proclaimed a fast, and everyone, great and small, put on sackcloth. Through prophet are not on Internet, they don’t advertise themselves they are silent, they’re not motivational preachers they preach pure salvation. 95% of Nigeria pastors are nothing but businessmen, renowned 419 and herbalists. Pls my people be careful. They’re are part of end time signs. Ppl are just expressing their opinions and u start threatening them. The 3 prophets said jonathan wud win and it didn’t happen period. Is God a man that He shud lie.Does he change His mind anyhow. They put their necks on the block and they r being chopped. Better to b smart and spk in parables and leave everyone guessing. You are one of the blind jokers? Where was the God of Moses, Aaron and Joshua when the White scoundrels were taking over the African continent and destroying the people? Today so many are being destroyed by the class between Christianity and Islam. Are these not imported religions? What has happened to Native religions? They were not forced to make predictions so they could have just been silent if they did not get a vision for the outcome of the elections. What it means now is that their integrity as men of God would be questioned from now on because God would not reveal something and not bring it to pass. I think they just took a wild guess based on the situation in Nigeria that as the incumbent government, PDP would win even if it meant manipulating the election/votes and because of the tension in the country, they felt there would be commotion. Well, next time they should just be silent or if they have to talk, they should not say God gave them a vision but that they ‘guess’ what may happen. @Ematex – and the if in their prophesies is? Get real please! People ! Don’t contradicts simple issues ! those Prophets are controlled by devil and they are embarrassed right now ! You won’t even hear then to make reactions to that for what? The coast is not clear yet I have a kind of uneasy calm within me in this election and the prophecies . Gos may not have been through with this election !!! Sometimes, it’s not always the fault of the prophet. prophecies, they shall fail; whether there be tongues, they shall cease; whether there be knowledge, it shall vanish away. The presidential election has come and gone but once again ,it has cast serious doubt on the credibility of many prophetic ministry in the land . next president of Nigeria come May 29th 2015 .
president sounded like a fairy tale . or man ? Of course man. This is where God is different from mortal man . This is where his difference lies! man that he should repent . It is not in the divine to lie! Hath he Spoken it ? Here we have questions. Hath he said it ? That is the question begging for an answer. committed to making it good ! bringing it to pass . phrase “it was so “appeared . There was never a God said without it was so . So the credibility of God is not in doubt . My own word , not man,s word ,but my word . is fake ? Not in all cases! a lot on this as we go along . something and the people prayed to change It . We have a classical example in Nineveh . and Nineveh shall be overthrown. greatest of them even to the least of them. judgement would be unrighteous . wrath would be averted . requirement for mercy and they were spared. make us to be at peace with God . from God shook their streets with divine warning. was as high as the heavens were blotted out ! chosen and favoured that person . When God said Saul will be king, he became king. some true prophet can also missed it sometimes . It happened several times in the bible . him . He couldn’t see what a donkey saw ! from the death angel ! way that we should go. His words does not fall to the ground . describing him vividly before his arrival . He didn’t have any problem identifying saul . whom among them is God,s chosen! holy anointing oil on the wrong person . Lord’s anointed is before him. good looking and said surely ! start prophesying to them . never be defeated by the opposition ! election to the opposition . But the pattern of our democracy has changed ! pattern of our democracy ! service and missed it but yet not a false prophet ! when he asked them who do you say I am ? peter said you are the son of the living God . Ghost stream few moment before ! percent accurate at hundred percent of the time ! which is in part shall be done away. everything is given in prophecy . word is , it is still limited . It is only in part . person to walk in faith ! into the piece that was given to you . parts that are not given to you ! Great explanation. God bless you. Hmm. Prophecy on Jonathan’s victory failed, not because the prophets did a guess work on the apparent political pattern. It failed because he did not meet the condition expected of him to be fulfilled to continue his tenure. Any promise from God comes with a mandate to be fulfilled. I checked that when I found, two weeks before the election the table was turning against him. But then, it was too late to change the message. I warned him through his friend who is my ally, but his securities did not let the message pass. Let all critics continue to criticise. But the judgment of prophets do not lie in the hands of men but God only. People like prophecy so they easily get deceived. The word of God is the best prophecy, not what people say. Now, shall they continue with this career? Whether or not, God is not oblige to say anything about the elections of any country, is not a profession that they most give a prophecy about things that has nothing to do with the salvation of our souls. Even it came to pass does not make who ever to be a prophet, a nation is not made by a prophet nor can it be build by prophecies, wisdom is profitable to all. Prophets let go free Gods people and stop deceiving them by prophecies which at most time is true at also not true at most times, the church of Christ is not made of prophets but apostles, but the prophets of the old testament are the foundation of which this new testament stands. we have no measure prophets in the new testament, Christ is the is the more sure Word of prophecy by which we look in to a lamb that shines in the dark place until the day dawns and the morning stars arise in us. leave God to judge.The bible says touch not my anointed and do my prophet no harm.Be very careful the kind of ill words used against these men of God, it is not for anyone of us to judge their positions/Stand in God. @ Sister Mary how long will it take you to realize that these people are not for real they are full of all tricks to drain people’s wallet. You don’t have to share emotion with these Rogues for receiving all sorts of insult from different angles. This is a wake up call for people like you who praise pastors more than God. only God is worthy to be praised. He is the only one who will never let you down. They all lie saying God said when God has never reveal anything to them. The only verse they referenced from the Bible is “Touch not my anointed an do my Prophet no harm” to cover their bad deed. They should have kept quiet instead of displaying their ignorance to the World. God is not a man, He can never lie bear it in mind that He is not yet through. So those of u who are mocking the prophets be careful, even this night Iginla repeated all he said earlier so don’t think is over cos Jehovah is still saying something. Yes jonathan could have won because he has God on his side.but because of his political kinsmen from south west who advice him to visit shrine and ogboni fratanity.remember what happened to saul in the bible exactly to what jonathan did after spent more for his pastor.then he got defeated by Gods anger. No be God, na money dey talk. Not every Prophet is of God. Some are called but some called themselves. Just disregard those so called prophecies and let us pray for God to guide Gen. Buhari as he leads this nation filled with difficult people aright. The task ahead is daunting and onerous, but with God, all things are possible. If Nigerians are as righteous as the number of churches and Prophets, our nation will be the best on earth today. Remember what the Bible say, on the last day many will say i heal the sick,dumb, blind, and prophesy in your name, imagine what his reply will be, you worker of inequity depart 4rm me i know you not. economy. He will surely bring good luck to us. week of the year 2015.
covenant of victory and blessing with the people of Nigeria. has also predicted victory for President Jonathan. These prophets are not fake. God is not thru with our election matter. Let’s wait. These are Voice in the Kingdom, don’t joke with ur destiny by calling them fake. God is not asleep. The Truth is some many of these so called Men of God are simply fake and modern day herbalists. They calculated what they thought would be the outcome of the election based on usual PDP fraud and opened their mouth to deceive themselves. In fact they know in all honesty that God never told them nothing. In fact they are day dreamers. They wanted to shore-up their standing as people who hear and interact with God. Now they have failed and shown their lack of spirituality. Their so called prophesies was definite. They minced no words in opening their God forsaken mouth to talk ignorantly. These are end time demons ministers of the underworld. They are fake and no we should spare no effort to bring them to order. They have deceived so many souls and sent a lot more to hell. Go to some of them for prayers when you feel you need their prayers. They will confuse you more. They will tell you all those who are after your life. They will sow as seed of discord between brothers and sisters. let us not be fooled. If half of the so called pastors in Nigeria today are serving the True Living God, Nigeria will be a better place. Go very close to them….You will tell better. They are not what they preach. Sooner than later…the wind will blow once again and their evil deeds will come to light. Say nothing if you have heard nothing from God. God cannot be mocked. The Bible said in Revelation 22:19 And if anyone takes words away from this scroll of prophecy, God will take away from that person any share in the tree of life and in the Holy City, which are described in this scroll. Beware of these Religious jobbers. They are hungry, desperate and work not for God!! sad to see that men of God don’t talk because of fear and bribe. No matter what we think about these prophesies like others have rightly advised, let us allow God to be the judge. Let no man incur the wrath of God by trying to play God. Don’t try to fight His battles for Him as He is equal to the task. Why do people like drinking panadol for another person’s headache? If these men have erred, allow God to be the judge. You read the bible on what God said about judging others and you are falling into that sin while talking about others. I believe we all have our own shortfalls as no man is perfect. Deal with yours first and allow them to face God when the time comes instead of resorting to insults and name callings thereby putting yourself in trouble. Freedom of speech does not mean people will no longer be cautious with their choice of words. The bible said that every man must give account of every careless word that proceeds out of our mouths so watch it people. Prophesies are from God. Prophesies will definitely fail when mortal men attribute them to their own power,when it is no more God says but i say. God will never share his glory with any man. Moreover most of the prophesies are hinged on tendencies not really spiritual. Many great men of God over time have drifted towards carnality. God will only reveal to those that are humbled enough to hear him and not those who desire for their will to be done. God bless Nigeria. Not every success or victory is from God. When a prophesy fails don’t blame the Prophet. Satan likes vain glory. He likes to disgrace the men of God. and he likes to change good things to bad. If truly a success is from God it will be a permanent joyful and comfort one. But vain glory doesn’t last. It brings hardship and affliction. One thing is certain when a false goes for years one day truth will surely catches up with it. Let us wait and see who is telling lies and who is saying the truth. The truth shall prevail. But God did not promise this hardship with us, but satanic antics caused it.